EDITOR’S NOTE: Payza seems to have taken an important step Friday in the battle against online fraud. The payment-processing company perhaps deserves an accolade for that. But it’s too soon to heap praise on Payza. We are particularly concerned about the phrasing of a specific line in Payza’s altered User Agreement. More on that below . . . UPDATED 7:29 A.M. EDT (JULY 17, U.S.A.) Is Payza, the payment processor operating in Canada that recently changed its name from AlertPay, finally doing the right thing? Or is it just lip service? What, precisely, does Payza mean? That expressing a literal return rate no longer is OK, but all can be cured if Payza’s current HYIP purveyors and Ponzi-board hucksters hide veiled or direct references to the return (perhaps in the back offices of HYIP affiliates or someplace else out of view of the public and search engines) or somehow find a word combination that avoids a literal expression of a return and instead relies on a deeply couched expression? This is an important question because the HYIP “industry” cannot exist without the financial vendors that enable it, either by turning a blind eye or choosing not to peel back a single layer of the onion because choosing to see is bad for profits. The last thing the “industry” needs is an invitation to become even more clandestine in its dealings, even more clever in its use of linguistic deception, information suppression or outright misinformation. The threat to individuals and the world’s financial infrastructure posed by con men and teams of accomplices in the thousands or hundreds of thousands already is untenable. Payza needs to reassess its use of the phrase “literal rate of return.” Left untouched, that phrase easily could turn what’s already a dangerous, wink-nod “industry” into even more of one, thus providing scammers a new back door and actually making the problem of international financial chicanery on the Internet even worse. Because AlertPay basically chose for years to gorge itself on HYIP fees and not to take the clues offered by the prosecution of e-Gold in the United States (by members of the same team that prosecuted the AdSurfDaily autosurf HYIP, BTW) and the disintegration of e-Bullion (while its operator stood accused of arranging the brutal contract slaying of his wife, a potential witness to e-Bullion’s Ponzi-sustaining fraud), we cannot yet offer Payza three cheers. Let’s pause for a moment to state the obvious, something that somehow often gets overlooked by HYIP apologists: Real people — living, breathing human beings — are being sucked into these utterly contemptible “programs” that are being enabled by processors such as Payza and SolidTrustPay. And suddenly — out of the blue — JSS/JBP announced it was using a “WORLD RENOWNED LAW FIRM” to assure compliance. These things bizarrely clashed with recent claims by Frederick Mann, the purported operator of JSS/JBP, that attorneys could not be trusted, that government employees weren’t welcome in the “program,” that registering with securities regulators was a sign “you’ve signed up to be a slave, part of the slave system, and then they have jurisdiction over you and can shut you down” and that JSS/JBP members had nothing to fear because the “program” had no presence in the United States. Now, all of a sudden, JSS/JBP has found the religion of compliance — or at least the language of the religion of compliance. The Payza-dependent Zeek Rewards MLM “program” also is preaching the religion of compliance, even as it plants the seed that it can provide a JSS/JBP-like annual return of between 365 percent and 730 percent without being the Bernard L. Madoff Investment Securities LLC of multilevel marketing. Part of what Zeek appears to be doing falls along the lines of not expressly stating a literal return. Welcome to the world of vomitous MLM in the year 2012. The players are eager to tell you what they’re not, less eager or completely unwilling to tell you what they are, and can bring a virtually unlimited supply of Stepfordians to the fore to help them cloud the issues. Zeek has told the public it is not a “pyramid scheme.” It now says it will ban members who describe the “opportunity” as an investment program, despite the seed Zeek plants that participants can earn a return of between 1 percent and 2 percent a day. Some Zeek affiliates are practically tripping over themselves these days in what strikes us as a bizarre race to see how many times they can fit the words “attorneys” and “compliance” in their forum “defenses” for Zeek. This Blog has not seen one instance in which a Zeek attorney has described the “program” as legal. Even so, we’ve seen plenty of examples in which Zeek affiliates implied that attorneys had given Zeek the all-clear and at least a few examples in which affiliates implied that agencies such as the SEC and FTC had scrubbed Zeek for compliance and found it in fine fettle. There have been hugely disingenuous claims from Zeek affiliates in this area — everything from describing the lack of any action against Zeek by the SEC or FTC as evidence that the agencies had examined Zeek and found nothing lacking to planting the seed that the lack of any action by the agencies is proof that Zeek is operating lawfully. Zeek itself played this miserable game. In June, a North Carolina television station carried a report that suggested Zeek had been found to be operating lawfully by the office of North Carolina Attorney General Roy Cooper. Zeek linked to the TV station’s video report on its news Blog and certain Zeek promoters pointed to the report as proof of Zeek’s legitimacy. But Cooper’s office said it never said Zeek was operating lawfully. After the TV station was contacted by Cooper’s office, which was concerned about the clarity and accuracy of the video report, the station removed the report. The incident produced one of those awkward moments that too often accompany the MLM trade: Zeek plainly liked the TV report because it construed Zeek as operating lawfully. The report then became a tool in Zeek’s PR arsenal — and Zeek wanted to make sure its affiliates had the same tool. It used its Blog to point affiliates to the video, and some of them predictably used it as evidence the Zeek critics were wrong and to plant the seed that Zeek had passed muster in North Carolina. By linking to the report, Zeek tried to maximize its PR hand. When the report was removed, Zeek had nothing to say. The post on Zeek’s news Blog in which the company originally crowed that “Zeek Makes the Channel 2 News” now has been removed. Although the precise date and time in which Zeek removed the post are unclear, a Zeek affiliate with his own Blog sought to capitalize on the TV station’s report in a post that still remains. This post on the "Empower Network" Blog of a Zeek affiliate included a three-tiered headline and a link that pointed readers to a TV station's report about Zeek. Like Zeek itself, the "Empower Network" is an MLM "opportunity." 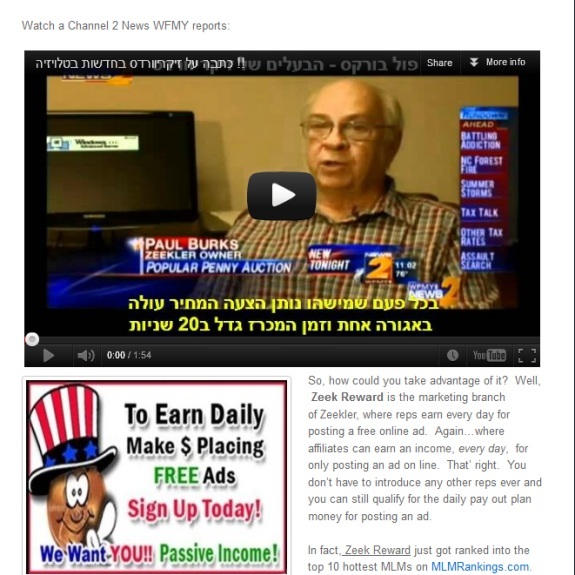 The affiliate’s post included a graphic that described Zeek as a “Passive Income!” opportunity. One link on the site pointed to the now-removed TV station video. Another link, however, pointed to post that included a YouTube version of the TV station’s report. That YouTube report included a headline and “crawler” in a language other than English. 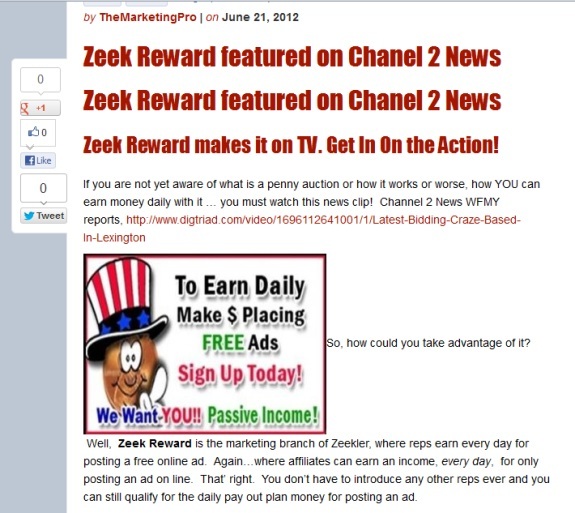 Like the post that included the three-tiered headline about Zeek’s TV appearance, the second post included the graphic that described Zeek as a “Passive Income!” program. The claim about passive income speaks to the heart of the issue of whether Zeek is selling unregistered securities as investment contracts and trying to disclaim its way out of an encounter with regulators. Although a TV station took down its link to a video report on Zeek, a YouTube version apparently existed. Confusing messages appeared repeatedly when the AdSurfDaily Ponzi case was playing out. All of it was monumentally embarrassing to MLM. In one instance — while it was awaiting a key ruling from a federal judge in October 2008 on whether it had demonstrated it had sufficient income and was not a Ponzi scheme at a hearing it requested and the judge granted in the interests of justice — ASD insiders leaked a story that ASD expected a revenue infusion of $200 million from a penny-stock company. The ASD Stepfordians immediately raced to forums to spread the good news. But skeptics immediately questioned the claim, pointing out that Praebius Communications — the penny-stock firm that supposedly was going to provide ASD a $200 million injection — did not even publish audited financials. SEC records later showed that, in October 2008, the same month ASD was awaiting the court decision and claiming a new $200 million was coming on board, Praebius stock was being pumped in a fraudulent-touting scheme. Over time, serious questions were raised about whether certain MLMers within ASD were engaging in bids to obstruct justice. Rumors were planted that federal prosecutors had secretly admitted ASD was not a Ponzi scheme but were clinging to the case as part of a bid to save face. In 2008, ASD members who did not even question the bizarre claims coming from ASD or ASD insiders raced to forums and spread a false report that Ponzi charges had been dropped against ASD in Florida. That development prompted the attorney general of Florida to issue a statement that, not only had Ponzi charges not been dropped against ASD in the state, they’d never been brought to begin with. Indeed, Florida charged ASD with operating a pyramid scheme. The names of both AlertPay and SolidTrustPay appear in court filings in the ASD Ponzi case. It is hardly coincidental that both Zeek and JSS Tripler/JustBeenPaid also have ties to the same processors, which are offshore from a U.S. perspective. These processors are the e-Golds and e-Bullions of Canada. They also are referenced in the Pathway to Prosperity Ponzi case, which the U.S. Postal Inspection Service called a global fraud affecting 40,000 people from 120 countries. In December 2010, the federal prosecutors handling the ASD case made the first public filing that referenced e-Bullion in the context of ASD. In 2011, e-Bullion operator James Fayed was convicted of arranging the contact slaying of Pamela Fayed, his estranged wife who was found slashed to death in a Los Angeles-area parking garage. There is absolutely no doubt — zero — that e-Bullion was enabling Ponzi schemes. James Fayed has been sentenced to death for arranging the brutal killing of his wife, a potential witness against him. It is beyond the pale — and almost beyond belief — that certain MLMers continue to insist there is something noble about these miserable money games, that they somehow represent the best of the free market and the entrepreneurial spirit, that they’ve somehow succeeded where other MLMs have failed. What they are are recipes for financial and personal destruction that operate as slow-motion Ponzi schemes. They need to be destroyed, not duplicated. Far from being exciting, new niches — as some MLMers tell the story — they are form-shifting monsters that spread the greatest financial cancers devised in the history of mankind. They are so dangerous that external fraudsters target them as a means of unloosing secondary frauds — everything from the issuance and passing of bogus checks to organized credit-card fraud. Some of them have been linked to narcotics-trafficking or money-laundering operations. Some of the investigators who assisted in the ASD Ponzi case also developed this case. Research by the PP Blog suggests the purported investment program was so sordid that promoters even claimed some of the funds were being used for the “humanitarian” purpose of assisting kidnapping victims in Colombia. In a sickening display of marketing theatrics, a claim was made that investors could “adopt” kidnapping victims for a payment of $1,000 and that the company would set aside $500 in corporate funds for each victim so that their families could have bright futures if the victims ultimately were released by their captors . . . The HYIP scheme allegedly was associated with an entity known as Evolution Market Group (EMG), which purportedly had a Forex component known as FinanzasForex. Investigators alleged in January that there were schemes within schemes in a tangled web of domestic and international deception that featured dozens of bank accounts, shell companies and various fronts for money-laundering enterprises, including companies purportedly in businesses such as real estate and car washes. The scheme was so corrupt, according to court filings, that some investors were told that, in order to leave the program whole, they had to recruit new investors, have the new investors pay them directly — and use the proceeds from the new investors to “recover” their initial outlays . . .
We do find a glimmer of hope in Payza’s announcement because Payza’s use of the phrase “any indication” implies it actually intends to exit the fraud-enabling business and intends to protect its reputation moving forward and make it harder for viral scammers who use its service to rob people without the aid of a gun. Yet another indicator of fraud is disclaimer language that seeks to cloud regulatory issues by planting the seeds that payouts are not guaranteed and that joining a “program” with a plainly stated or implied return does not constitute making an investment. Language in the full, six-paragraph announcement is exceptionally formal, bordering on the florid. But if the aim is for Payza to say no to fees and wrest itself from the wretched, pain-producing universes of HYIPs, autosurfs, cycler matrices and other “programs” that reach across national borders and fleece people on a global scale, the ornate language will become only a tiny footnote. What’s far more important is that Payza will have said no to the scammers and a subculture of eager, greedy pitchmen who help financial crime spread globally and line their pockets on the current (or pending misery) of their marks. It is possible these days for a scammer hiding in the darkest corners of the Internet to pick the pocket of a “customer” and contribute to a mortgage foreclosure or even the failure of a bank a continent away. Such “programs” often are pushed in the purported name of freedom itself, as a purported means of helping a neglected Everyman escape the shackles of poverty and become a free man who’s escaped his tyrannical captors. But because the scammers’ schemes constantly evolve and because they often rely on overblown prose to disguise the fraudulent nature of their “programs,” it is going to take more than just words from Payza to incorporate any real change. For example, could an “opportunity” that simply comes up with different naming conventions and avoids the traditional language of investments fool the checkers at Payza? Or could an “opportunity” that shields Payza from information perhaps by publishing it only in the back offices of the “opportunity’s” members escape scrutiny? And because HYIPs and their willfully blind, serially disingenuous promoters already are infamous for wink-nod presentations, the use of disclaimers and even outright denials that an investment program of any sort is being offered, will the criminal minds who dominate this cancerous space go into overdrive to come up with new and more clever ways to disguise fraud schemes? Masked investment “programs” — perhaps aware they are under scrutiny — taking once-public forums offline and engaging in bids to further compartmentalize information and scrub negative information. Management and affiliates of such “programs” making veiled or direct references to “attorneys” and “compliance” as a means of suggesting they are wholly lawful and embrace responsible corporate citizenship. Read the Payza post, which was made Friday at the close of traditional business hours in the Eastern United States. So do you predict Alert Pay is going to dump Zeek? That would cause a huge mess in Zeek world. Maybe it’s why Zeek has been so quiet lately. e: So do you predict Alert Pay is going to dump Zeek? That would cause a huge mess in Zeek world. Maybe it’s why Zeek has been so quiet lately. My view is that it’s generally unproductive to “predict” an event. If a “prediction” doesn’t come true, the scammers use it to deflect from the issues at hand. From time to time, however, I do engage in what I’d describe as informed speculation. I’d say it’s likely true right now that the operators and co-conspirators of some massive HYIP schemes are fearful they could find themselves divorced from their one-time enablers and very likely are engaging in guesswork on where best to move the money — if they can move it at all. My thoughts is you’ll see a lot more product-disguised Ponzi, such as PKI (Pigeon King International) instead of a purely financial ponzi (like HYIPs), if Payza actually enforce these rules they claimed they will implement. I have a feeling that RCMP / Interpol may have leaned a bit on Payza for this, but that’s IMHO, of course. From the postings on a few of the Ponzi boards it seems that Payza is sending out notices to a lot of the HYIP’s telling them they have until the 20th to transfer their funds to a new payment processor. Any funds left in Payza will be frozen until they can work out a transfer to their new payment processor. No word if JBP or Zeek were sent notices. From one of the posts that mentioned their Ponzi de Jour received the notice, they did say that Payza did refer them to another payment processor, but they could transfer to any payment processor that would accept their account. It also seems that STP is also moving in this direction based on a report issued by Stella last week. This is due in part to wanting to be approved by a bank and credit card company here in the US. I also think FSA is putting a lot of pressure on all the Canadian payment processors to be compliant with their rules or they will lose their license to be a payment processor. It will be intersting to see the developments of Payza, and if STP is also moving in this direction, in the next couple of weeks. Of course those payment processors not in Canada or the US will be licking their chops at the increased business they will receive with these moves. Times definitely are a chang’in, and it remains to be seen if it is for the better. Let’s hope so. I’m not holding my breathe on Alert Pay/Payza turning its back on the zillions of dollars it has made over the past years out of illegal ponzis and HYIPs and even less with STP, but you never know. There is room in the market for an alternative to Paypal, but it will have to be a lot cleaner than Alert Pay/Payza and STP are at present before it is a real and attractive option for honest etraders. Should this come to fruition, it will certainly transfer a lot more responsibility back on to potential victims. People are going to have to try a lot harder to lose their money if they have to both fall for the fraudsters’ lies AND seek out a payment processor willing to work with shady operators, ESPECIALLY if said processor/s are based in out of the way exotic locations. littleroundman: Should this come to fruition, it will certainly transfer a lot more responsibility back on to potential victims.People are going to have to try a lot harder to lose their money if they have to both fall for the fraudsters’ lies AND seek out a payment processor willing to work with shady operators, ESPECIALLY if said processor/s are based in out of the way exotic locations. I wouldn’t count on that. Just the fact paypal can’t be used should be enough of a warning but it’s not. e: So do you predict Alert Pay is going to dump Zeek?That would cause a huge mess in Zeek world.Maybe it’s why Zeek has been so quiet lately. No, you have to understand that no one would ever use Payza, STP or any of the other bottom rung payment processors if they had any better alternatives available to them. The fees are high and the regulatory issues cause what seems to be no end of payment delays. It’s true that the HYIP / Rev Share world are completely dependent on the bottom feeder processors but it’s equally true that the bottom feeder processors are just as dependent on the HYIPs and Rev Share scams. The good thing is that I just demonstrated a clear example of a codependent relationship without even thinking about any of my many ex’s. No, Zeek Rewards is the poster child of the type of program Payza is looking for. ZR is emphatic about pretending that people don’t “invest” with them in the first place and if you speak English and make any ROI claims they just might cut you off. But despite all of Mr. Dooly’s glowing reports on ZR ZR still has no recourse other than to transact through the bottom rung processors. More and more HYIPs and Rev Shares will start implementing ZR’s hear no evil, speak no evil compliance model and just like ZR, they wont need to change the mechanics of their payment plans in the least. I don’t think anyone thinks it can be stopped entirely. The way I see it is, given the current lack of political will to crack down hard on ‘net fraud, the only two avenues left open to those tasked with regulation are education and at least attempting to make it a little bit harder for those on both sides of the fence, i.e. scammers and scammees to participate. Nice show Payza puts on here….Looks like all Payza aka alert-pay have done here is open a new payment processor called “EgoPay”…..They ban hyips from payza which makes them look good in the Gov’s eyes whilst at the same time they pushing all the scams over to egopay in the hope that it will keep the Gov off their backs for a little longer…. In other words this is all a show to buy some time…. okosh: Nice show Payza puts on here….Looks like all Payza aka alert-pay have done here is open a new payment processor called “EgoPay”…..They ban hyips from payza which makes them look good in the Gov’s eyes whilst at the same time they pushing all the scams over to egopay in the hope that it will keep the Gov off their backs for a little longer….In other words this is all a show to buy some time…. Without wanting to appear cynical, I think you have hit the nail on the head. If Alert Pay/Payza go truly “legal” and, like Paypal, ban all HYIPs and productless MLMs, they will lose zillions of dollars. The fact that they could recuperate these zillions over time, by replacing their dodgy clients with legitimate ones is all very well, but it would take a long time. The very fact that their ToS already forbid illegal schemes, but then have a category of “special businesses” who they deal with at a higher comission level says it all. So did ASD. It sold Adpacks but was still a Ponzi. You really are new at this aren’t you. I think we now have our answer as to whether or not Payza was serious about cleaning up its act to get rid of illegal programs as their client. 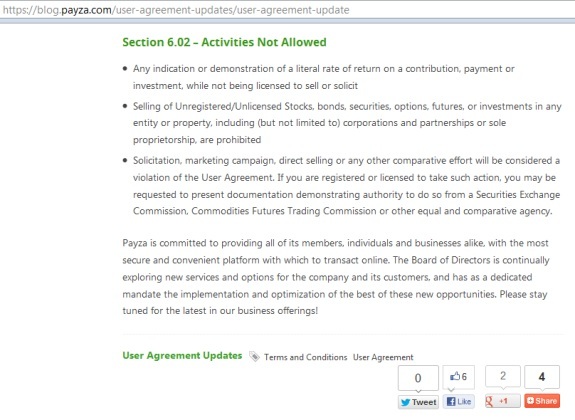 While not grammatically correct, the point is still made that this allows Payza to get around their new TOS rules, and just look good on paper, while increasing their take with their HYIP clients. Now we wait to see what STP does or doesn’t do; or if they try what Payza has done. Guess the leopard doesn’t change its spots, it just makes them look different. NOTICE! The launch of my brand new company, $25 Dollar Miracle is being PLACED ON HOLD. Why? Payza, our selected and exclusive payment processing system, who appeared to have made some big changes for the better, is not as they claim. July 02, 2012, someone broke through their (supposed) secure site, broke into my account, locked me out, emptied my account, and Payza has nothing to say and are doing nothing about it; NO REPLY NO EXPLANATION! Avoid PAYZA payment processing system like the plague. This is all very amusing to me especially when our money system is a ponzi scheme in itself. I think people are missing the point of what is happening. Yes, corrupt companies should be put out of business if found to be corrupt but I feel something else is happening here. The ability for the small guy to make money is being taken away so that people stay dependent on the system. You need only look at how the world financial system is running to see true criminal activity in operation. Trillions stole from U.S. tax payers to pay off wall-street and the bankers with no one being held responsible for the lost of many peoples savings- really this is a joke.If an opportunity is implied to earn income there is no problem with this. The term “guaranteed” should not be allowed because nothing is guaranteed. People should be allowed to think and act for themselves and with their own sound judgement make their own decisions. Yes, there is a lot to clean up especially in the HYIP arena but to throw the baby out with the bath water makes no sense. It hurts the little guy and the more I think about it this is what it is intended to do, keep us dependent on a already established corrupt system. you scammers really need a new argument. You give your scam and yourselves away immediately every time you whip out that that poor excuse of an attempted distraction. you got in too late. you’re not getting your money back. The ability for the small guy to make money is being taken away so that people stay dependent on the system. It is NOT about stopping “the small guy” making money. It is about stopping “the small guy” getting conned and having their money stolen. The VAST majority of people who put their money in to these schemes – lose it. That is the way these schemes are designed, a few people at the top make money, everybody else loses. A typical scam will cause approx. 90% of the people involved to lose their money. Brand new seems to have a rather different meaning in your mind than it does to the general public, Kevin, seeing as there were ads for that company last year. And even then, they came across as a glorified chain letter rather than a business with a product or true service. Now, did someone hack into your Payza account and take the funds therein, or did Payza themselves take action against you for violation of clauses in their terms of service agreement? If it was the former, consider where else online you may have used the same password and username or email combination, and ponder whether that would serve as a chink in Payza’s security. If you do not want to lose your money and drop to a complete helpless situation, you should not consider these guys as your money manager! Once your money is in Payza.com account, you have lost it! Read more…. These guys are a group of systematic fraud activities. I was pissed of when it was Alertpay.com and now I gave a try with this Payza.com. They allowed depositing to Payza.com account by bank transfer without any problem and Payza system worked like a charm. I received payments from our customers to Payza account. I opened a support ticket. It really did take 5 days to contact me back as payza promises :). As I have mentioned before, that I do not upload funds to my Payza account but my customers pays to my payza account by bank transfer. Payza was asking me “Why do I upload money to payza account and withdraw back to the same bank account quickly”? It took a month I collected payments from customers to payza account before I did request for an withdraw from payza account, but Payza got disappointed. The emails sent to me were from “Payza fraud prevention analyst” :), who was lying that they have checked that I am uploading money to/from the same bank account, even I explained to them the uploads are from my customers and each of them are from different account. After above arguments, this “Payza fraud prevention analyst” kept me asking to send all the Bank account statements of my customers to them, even I tried to tell them that you cannot ask so and I cannot send Payza.com my customer’s Bank Account statements!! I collect image copies of bank transfer payments from my customers and we hold right to use those copies with our payment processing partners. I offered the copies to “Payza fraud prevention analyst”, but he did not want them :), instead he wanted bank statement of my account. Once I sent it to him he just hide away and stopped answering to support emails. After several support request this guy answered to me that he does not accept this bank statement, needs more recent one. When he said more recent one, it meant I need to send a statement of current month. The problem was, banks here creates a bank statement after the month end, but Payza guy wants it in the middle of the current month. In above situation I just took a screen print of my bank statement of most recent transactions’ first page. After I did send this, this “fraud prevention guy” completely disappeared. I have sent many requests for an update but COMPLETELY NO RESPONSE! !